Achieving the BC Forest Safety Council’s SAFE certification represents an investment in time and money, but the results are worth it, with the goal being reduced injuries and accidents in the bush. Guest Logging makes a point of leaving as light a footprint as possible in the woodlots where they carry out selective logging, because it’s the right thing to doand they want to be invited back. 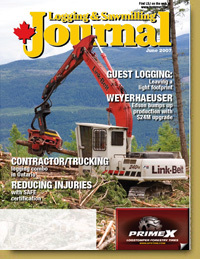 Ontario logging contractor Bruce Kropf has found a successful business model, using the services of a group of contract equipment operators to carry out the logging, while his company handles the trucking end. A BC reman company, Coldstream Lumber, has utilized the technical support of Forintek to look at better ways of manufacturing product, and to assist in developing effective equipment solutions. Weyerhaeuser has invested $24 million in recent years to re-work the green end of its OSB plant in Edson, Alberta, part of a continuous improvement program that has delivered results in the form of increased OSB production. Weyerhaeuser was able to achieve a successfuland quickchipper install at its Drayton Valley, Alberta, operation, using 3D modeling.